I showed you the first Systainer radio modification here, and now comes another from the Contractor Talk forum. Of coarse the advantage of building your own radio is the option to use just about any parts that you want. Contractor Talk forum member Winchester chose to use a JVC-R600 car radio that comes complete with iPod controls. 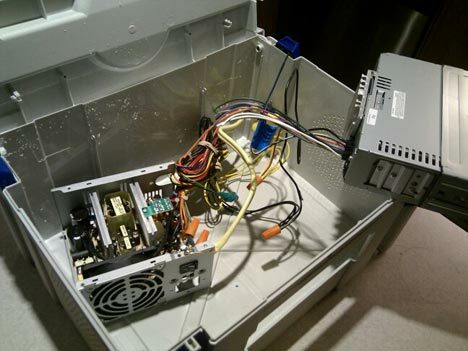 To get his 12 volt DC radio to run off of 120 AC, he is using a simple computer power supply. Using a computer power supply comes with a few great advantages, the first being plenty of watts to power your speakers. Another advantage is the ability(with a bit of wiring work) to power your USB devices using the power supplies 5 volt rail. Did I mention that PC power supplies are also cheap, and can be purchased for as little as $10. Add a couple more components, and you could have yourself a PC inside of the Systainer; that would be the next logical step. This build is still a work in progress, so you can follow along if you wish, and take notes for your own build. Though I should warn you not to join the forum unless you are a contractor, they eat DIYers alive.